The breaking heat of the Kgalagadi washes over the Resting Leopard. Click to enlarge - Resting female Leopard, Kgalagadi Transfrontier Park, South Africa. 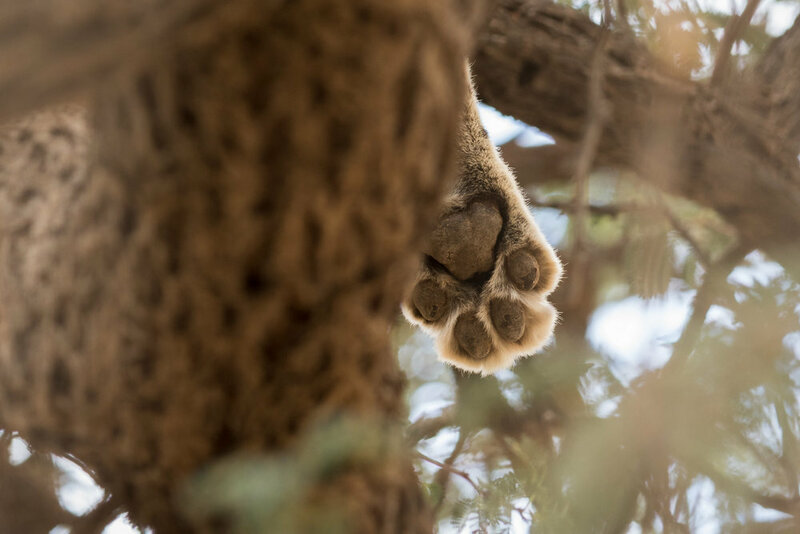 A lonely paw swings in a camel thorn tree. Nearby the dry river bed of the Auob stretches under the black clouds of late summer. A rushing wind, fresh with the scent of rain and dust, rolls through the grasses. In the east, the clouds tower along the valley’s edge; now-and-then the deep rumble of thunder keeps us company. There is rain coming; a storm coming, but not yet. Where better to sit, than next to a dozing leopard, under a black sky, with space to be and time to lose? If I think about my life, drift from memory to memory; is it just a thread of moments such as this, strung together like pearls on a string? This moment, this space, this feeling, is the stuff that life is made of. The leopard knows this but perhaps I had forgotten? Eventually, the leopard, sensing the setting sun and a creeping chill, came down from the tree. She stood, motionless for a heartbeat, and then set off to catch a dove and have a drink. The green expanse of the Auob was empty but along the craggy eastern edge, the sky was black. The leopard wandered across the valley, checking every now-and-then for danger and for food. She set off up the opposing slope toward the crags and the sky. In the west, the setting sun broke free, light played over the Auob and a rainbow painted the menacing clouds. She was oblivious and paused before jumping silently onto the ledge at the valley’s edge. Above her, the rainbow; behind her, the sun; In-front, the wilderness.